Over the last 18 months, the wearables market has started to mature and has grown considerably with new players introducing numerous products -- such as fitness bands, smartwatches, smart glasses, and other sensor-enabled devices. Using data compiled from approximately 328,000 consumer reviews since January 2014, the latest market study by Argus Insights reveals that after the holiday season of 2013, consumers briefly lost interest in wearables before steadily increasing demand reached its high point in January 2015 where it was four times the level of a year earlier. Since then, however, demand has slowed. According to the report, all the media buzz about the Apple Watch introduction stole consumer interest away from Fitbit and other wearables, as potential buyers waited to determine whether they wanted the Apple Watch. Interest in Fitbit devices resumed and grew once the Apple Watch details were announced, as Fitbit and other wearable manufacturers saw a strong 2014 holiday period. Since their IPO, Fitbit has continued to gain mind-share with more stakeholders in the marketplace. Consumer delight -- measured from the volume and the content of consumer reviews -- showed that Fitbit was achieving a very high level of buzz, though the satisfaction of their consumers is dropping while Apple is quickly gaining in delight. Other surprising insights include high consumer delight scores for smartwatch manufacturers Motorola and LG, as more consumers report their satisfaction from smartwatches than from fitness bands. 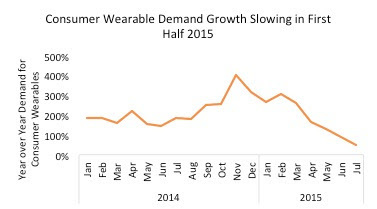 "Our analysis of review volume for the wearables market correlates directly with unit sales volume, and we have seen a significant slowing in consumer demand for both wearables in general and fitness bands in particular," said John Feland, CEO and founder, Argus Insights. Consumers expect their wearable device to do more than simply count steps, just as they expect to do more than just make phone calls with their smartphone. Mr. Feland believes it's clear that as the Apple Watch, the Moto 360 and the LG Watch Urbane outperform fitness bands in the hearts of consumers. Fitbit and others in this category will need to add more to their offerings to keep consumers engaged and coming back for more.